Sister taxa are any taxa derived from a common ancestral node. For a given set of taxa under consideration, a taxon is always most closely related to its sister taxon (or taxa). For any terminal or internal node giving rise to a taxon, the sister taxon is determined by, first, finding the node (common ancestor) for a taxon, then tracing along the branch leading to this node, back toward the root, until another deeper (more ancient) node is encountered. The first such node encountered represents the next most recent common ancestor of the taxon in question, and this ancestor is also shared by the sister taxon (or taxa). If the node is dichotomous (i.e., there are only two branches emerging directly from it), the taxon has only one sister taxon. If there are more than two branches emerging from the node, the node is a polytomy (i.e., the branching is polychotomous), and the taxon has multiple sister taxa. In a polytomy, each sister taxon is hypothesized to be equally closely related to each other. In this example, note that terminal nodes snake and lizard are sister taxa. The branches leading to them meet at node 1 (red arrow) to form clade a (red bracket). Likewise, bird and crocodile are sister taxa. They are members of clade b who share a common ancestor, node 2, that lived more recently than their last common ancestor shared with clade a, which is at node 3. 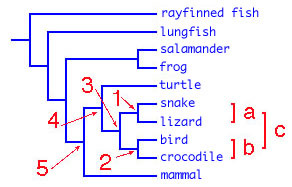 According to this cladogram, a bird or crocodile are equally closely related to a lizard (or a snake), because they are related by way of the common ancestor at node 3. Note also that clade a and clade b are sister taxa. One way to think about this is to consider the snip rule for dividing clade c into the daughter lineages derived from the common ancestor at node 3. Imagine traveling up each branch from node 3 only a short distance before snipping. What falls off are the sister taxa: clade a and clade b.